where is value being created… and destroyed… in the ecosystem in which we, and our customers, are engaged? what new white space opens up from answering this question and the new perspective it creates, what role(s) might we play within these ecosystem and what capabilities do we bring to the table to do so? This is different. And, if you look at every explosive growth today – and we believe tomorrow – you will see that underlying their growth is the asking, and answering of these new strategic questions. Explosive growth comes from tackling specific points of “friction” and orchestrating capabilities to solve it. Think Uber, tackling the friction of inconvenience. Airbnb and the friction of finding lodging. Amazon and eliminating the friction of getting just about anything to you quickly, via Prime. Tesla and the friction of energy conservation. And so on.What’s particularly interesting about every one of these examples – and EVERY example of explosive growth company – is that: a) these organizations picked a problem to own – e.g., “planted a flag” on this challenge, and b) orchestrate capabilities from a variety of players to tackle this problem, and as a result, shaped an ecosystem to capture explosive growth. Every one of these problems required new capabilities – what we call the ‘new 20%’ of capabilities critical to capture 70% of the new value created. You do NOT need to “own” or control all of the capabilities to do so. Uber’s new 20% rested on insight into where to deploy different assets (cars) they did not own. The same with Airbnb. Hmmm… the same with Amazon, though Amazon’s new 20% rested on several sets of new 20% capabilities: its’ recommendation engine based on previous purchases and like-minded folks and their recommendations, amazon web services’ open standards to get businesses to use their cloud services quickly and easily for whatever and however they wanted to use them. And Tesla’s opened up all of their patents around energy to mobilize the insights and capabilities of the world to accelerate everyone’s (and their) development. So, here’s a question for you: what is your new 20% of capabilities critical to capture the explosive growth potential, and most importantly, how do you orchestrate your ecosystem around your new foundation of value? A fancy word for a simple concept, with profound implications. A business ecosystem merely reflects the orchestration of capabilities from different organizations to deliver value. That’s it. There is much confusion of this term today. For us, it is simple, tight, pragmatic… and critical. What is particularly interesting from our perspective, is that there are distinct patterns to business ecosystems; not all are relevant to any one company. Yet all reflect the new business model (again, a fancy term for a simple concept – namely, how you orchestrate your resources to deliver value) that drive the explosive growth models of today. We left this for last because it is the most controversial, and arguably, if your aim is transformation, the most critical. From the customer’s perspective. This is the call for action for just about everyone today. For good reason. No customer, no business. No meeting their changing needs and expectations, no growth. Most efforts around customer centricity involve customer segmentation and customer journey mapping from the perspective of the products and services you already have… with the underlying question being: how we improve the customer’s experience regarding how they engage with us and use our existing set of products and services. This is a logical question if your focus is incremental and perhaps even adjacent growth. But, this section is about “aiming for transformation.” Which requires a different question to ask with significant implications on where and how to focus your innovation program. Recall the first two lessons of this section – on the new strategic question and planting a flag around a specific problem to “own.” Given this, the new question, from a “beyond customer centricity” perspective is: where do your (existing and potential) customers spend their time, monies and efforts and how do you engage in those ecosystems of engagement – current products and services be damned. A provocative question. A critical one if the aim is transformation. 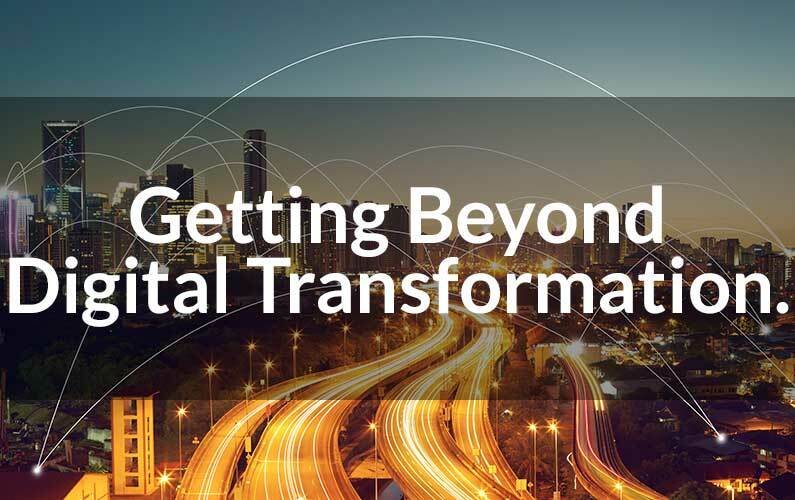 How are you getting beyond digital transformation?